Rescuers have begun a block-by-block search of tens of thousands of Houston homes looking for anyone – alive or dead – who might have been left behind in Harvey’s floodwaters. The confirmed death toll from the disaster stood at 39 and is expected to rise, while the floods have damaged more than 87,000 homes and destroyed nearly 7,000 statewide. Elsewhere, the loss of power at a flood-crippled chemical plant set off explosions and a fire, and the city of Beaumont, near the Texas-Louisiana line, lost its public water supply. The remnants of the storm pushed deeper inland, raising the risk of flooding as far north as Kentucky. Harris County Institute of Forensic Sciences spokeswoman Tricia Bentley said on Thursday night that the office has confirmed seven more storm-related deaths. Harris County is home to Houston and has so far accounted for 25 deaths from the storm. Ms Bentley said earlier in the day their morgue was close to capacity because bodies were piling up from the storm and from other deaths in the fourth-largest city in the US. She said the backlog eased a little on Thursday as some funeral homes were able to pick up remains. More than 200 firefighters, police officers and members of an urban search-and-rescue team fanned out across the Meyerland neighbourhood for survivors or bodies. They yelled “Fire department!” as they pounded with closed fists on doors, peered through windows and checked with neighbours. The streets were dry but heaped with soggy furniture, carpet and wood. “We don’t think we’re going to find any humans, but we’re prepared if we do,” said District Chief James Pennington of the Houston Fire Department. The searches are expected to take up to two weeks, and unlike during Hurricane Katrina’s aftermath in New Orleans, crews used GPS devices to log the homes they checked rather than painting neon X’s on the outside. That avoided alerting potential thieves to vacant homes. The blasts at the Arkema plant north-east of Houston also ignited a 30 to 40-foot flame and sent up a plume of acrid black smoke that stung the eyes and lungs. The blaze burned out around midday, but emergency crews held back because of the danger that eight other trailers containing the same compound could blow, too. No serious injuries were reported. About 325,000 people have already sought federal emergency aid in the wake of Harvey. More than $57m in individual assistance has already been paid out, Federal Emergency Management Agency (FEMA) officials said. The Harris County FEMA director said the agency was looking for ways to house people who lost their homes to Harvey. The priority is to get them into some form of temporary housing, with hotels being one option, he said. Although it has been downgraded to a tropical depression, Harvey was still expected to dump heavy rain on parts of Louisiana, Tennessee and Kentucky throughout Friday. Forecast totals ranged from 4 to 8 inches, with some places possibly getting up to 12 inches of rain. 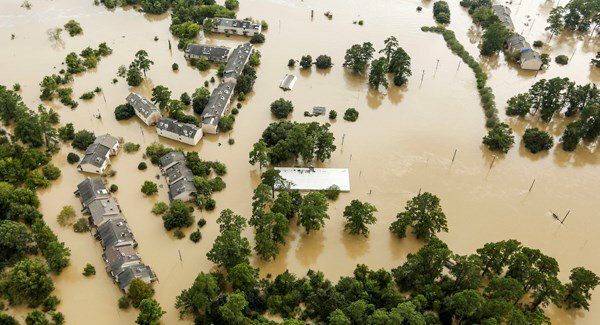 As the water receded in Houston, the greatest threat of damage shifted to a region near the Texas-Louisiana state line. 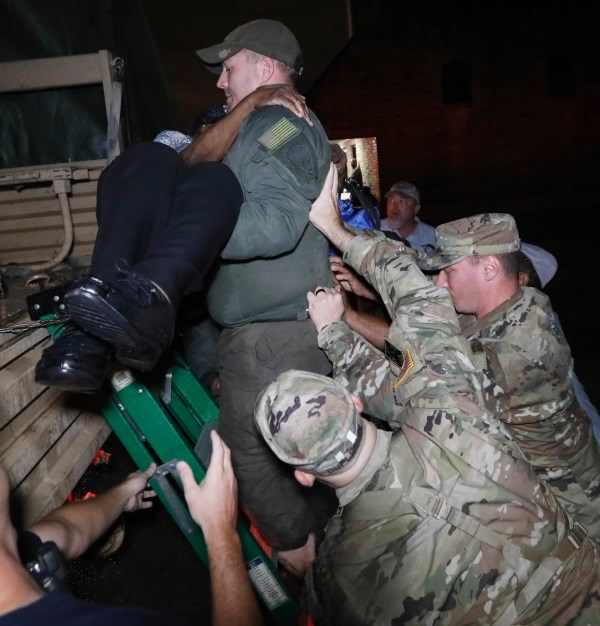 Some residents in Beaumont, Texas, began to get anxious after the city of nearly 120,000 lost water service when its main pump station was overwhelmed by the swollen Neches River. Officials said they were having difficulty bringing in enough bottled water to set up distribution stations because of flooded roads.